You will earn 9,761 Reward Points. Earn 1 reward point for every 1 dollar spent. 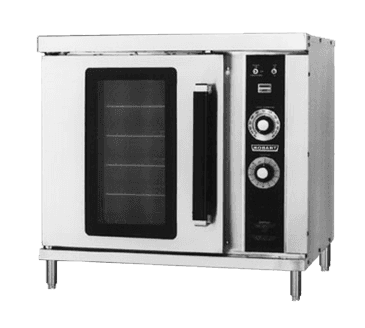 The Hobart HEC202-240V Convection Oven is a half-size, double-deck unit that runs on electricy (240v). Each level contains a single full-height door that opens 180 degrees to the left. Its stainless steel door seal and liner, as well as high-density insulation in the oven walls, ensure that its set temperature is maintained throughout the entire cooking process. A permanently lubricated fan motor eliminates the need for routine maintenance, and a stainless steel design allows for easy cleaning and lasting durability. Other features include a porcelain interior, 10 oven racks, a cool-to-the-touch handle, and an oven cool-down switch. It measures 66.75" tall, 30" wide, and 25" deep. Built to last, the Hobart HEC202-240V Half-Size Convection Oven features a durable design and easy maintenance. This oven runs on electricity. This item is also complete with solid state controls. This oven is 60.50 inches tall and 30 inches wide.